With her 2015 Last Night of the Proms opener ARISE ATHENA! 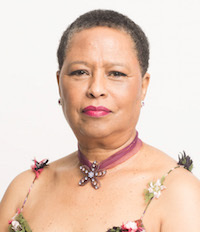 Eleanor Alberga cemented a reputation as a composer of international stature. Performed by the BBC Symphony Orchestra, BBC Chorus and conducted by Marin Alsop, the work was heard and seen by millions. Her music is not easy to pigeon-hole. The musical language of her opera LETTERS OF A LOVE BETRAYED (2009), premiered at the Royal Opera House’s Linbury stage, has drawn comparisons with Berg’s Wozzeck and Debussy’s Pelleas, while her lighter works draw more obviously on her Jamaican heritage and time as a singer with the Jamaican Folk Singers and as a member of an African Dance company. But the emotional range of her language, her structural clarity and a fabulously assured technique as an orchestrator have always drawn high praise. Born in Kingston, Jamaica, Alberga decided at the age of five to be a concert pianist, though five years later she was already composing works for the piano. In 1970 she won the biennial Royal Schools of Music Scholarship for the West Indies which she took up at the Royal Academy of Music in London, studying piano and singing. But a budding career as a solo pianist - she was was among the 3 finalists in the International Piano Concerto Competition in Dudley, UK in 1974 - was augmented by composition with her arrival at The London Contemporary Dance Theatre in 1978. Under the inspirational leadership of its Artistic Director Robert Cohan, she became one of the very few pianists with the deepest understanding of modern dance and her company class improvisations became the stuff of legend. These in turn led to works commissioned and conceived for dance from the company, most notably the piano quintet CLOUDS (1984). Alberga later became the company’s Musical Director, conducting, composing and playing on all LCDT’s many tours. The orchestral works, SUN WARRIOR (1990) written for the inaugural Women in Music Festival and her dramatic adaptation of Roald Dahl’s SNOW WHITE AND THE SEVEN DWARVES (1994) for large symphony orchestra and narrators, premiered at the Royal Festival Hall in 1994 with Franz Welser Möst and the LPO, helped build her growing reputation. In 2001 she was awarded a NESTA Fellowship for composition. 2001 also saw the completion and premiere of a highly praised first VIOLIN CONCERTO, written for Thomas Bowes and commissioned by The Scottish Chamber Orchestra under Joseph Swensen. Chamber music, both in the more traditional form of three String Quartets and a Piano Quintet, and for more unusual line-ups, abounds. An unfolding series of Nocturnes - notably, SHINING GATE OF MORPHEUS and SUCCUBUS MOON - featuring horn and oboe respectively with string quartet, is an expanding project. Works for voice have more recently come to the fore with a luminous setting of George Herbert’s THE GLIMPSE and most recently the song cycle THE SOUL’S EXPRESSION to poetry by George Eliot, Emily Bronte and Elizabeth Barrett Browning; both premiered by the baritone Jeremy Huw Williams. Other recent commissions and works include the ‘cello solo for Robert Irvine RIDE THROUGH; GLACIER, for mixed ensemble, and the piano solo OH CHACONNE! conceived as a prelude to the Bach-Busoni Chaconne for which she played in its original form as the dance piece ‘Lingua Franca’, choreographed by Robert Cohan on his 90th birthday. She is currently working on a second violin concerto, a suite of shorter piano works and an orchestral work for the London Mozart Players ‘TOWER’. Alberga now lives in the Herefordshire countryside with her husband the violinist Thomas Bowes and together they have founded and nurtured the Arcdia festival.